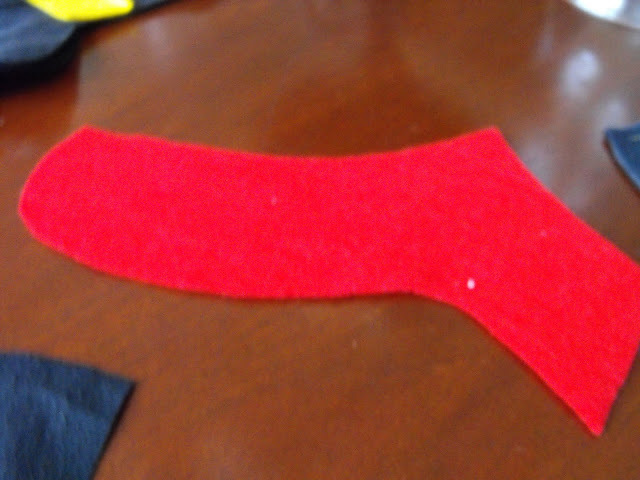 The joy's of being a "Room Mother" means you get to make fun things like snowman stockings...and many of them. I thought some of you may want to try this for your lil one's too. 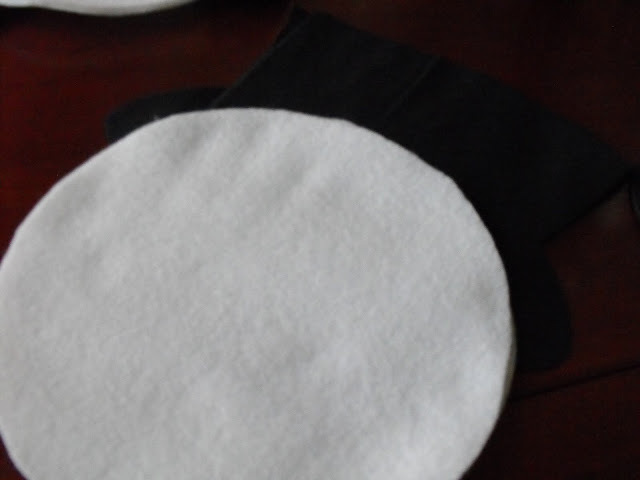 I started out with two dinner plate size "felt" circles. You can make yours as big or small as you like. 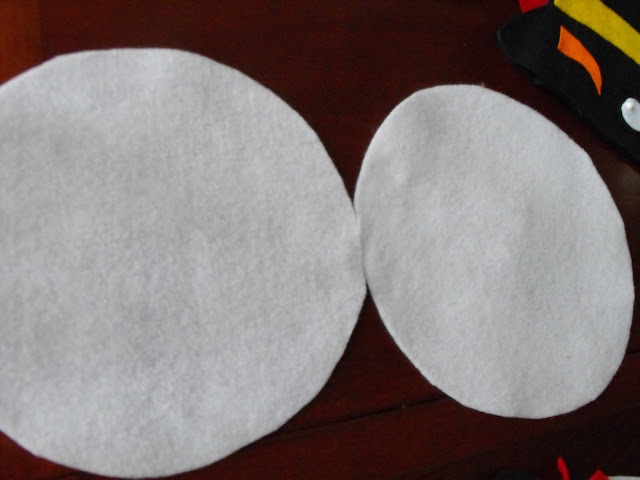 I then made two hat shapes. You will only need one hat band and holly sprig for each stocking. The holly that you see here has two white dots. That is glitter glue and will dry clear (please forgive pictures quality) I then cut out some eyes and a carrot nose. One scarf. Keeping the two heads together I put them on top of one of the hats. 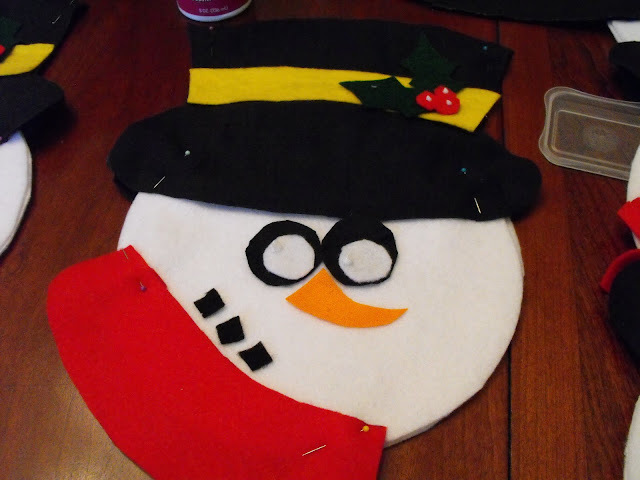 Add your hat with your glued on rim and holly to the top. You should have one fancy hat on top of two heads with the plain hat on the bottom. I pinned these together. I cut little strips in my scarf just to give it "more cuteness". 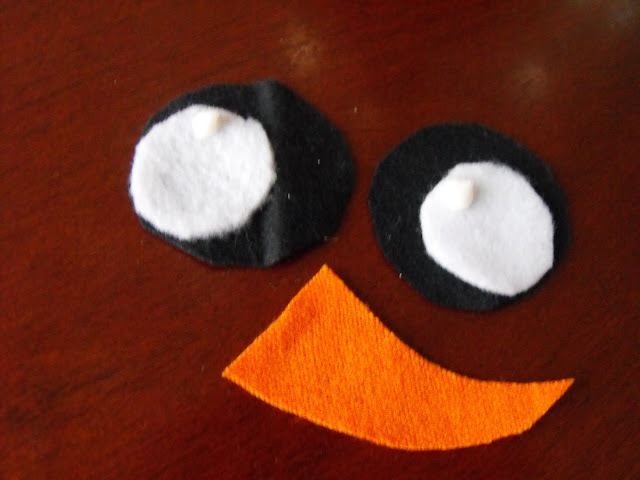 I then glued my eyes , nose, and mouth on. I tilted the scarf...you know, for "more cutness". Now you can glue your stocking or sew it. I will sew mine (MIL's help). Just a reminder...leave the top of the hat open so you can stuff goodies inside. I wont turn mine inside out ...just sew right along the edges. 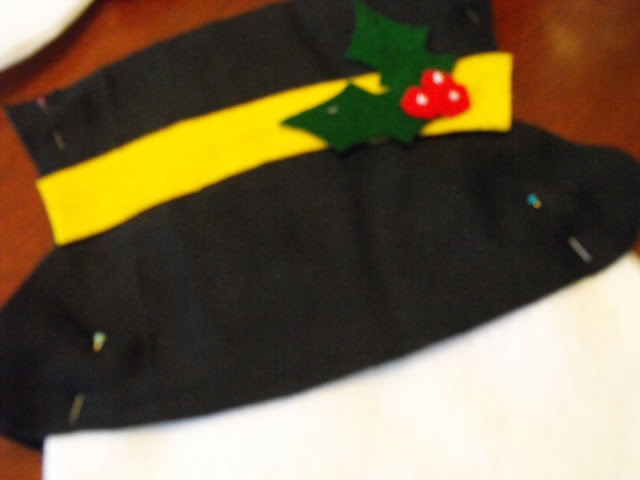 After you sew /glue your stocking together make sure to glue down your hat brim on the front and back of your stocking. I added a little glitter glue on the eyes and holly berries. That is the white dots you see. 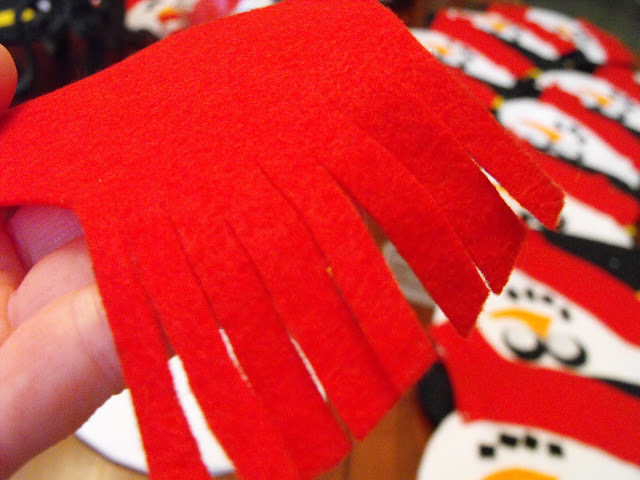 They will dry clear and add a little "cuteness" to your snowman. 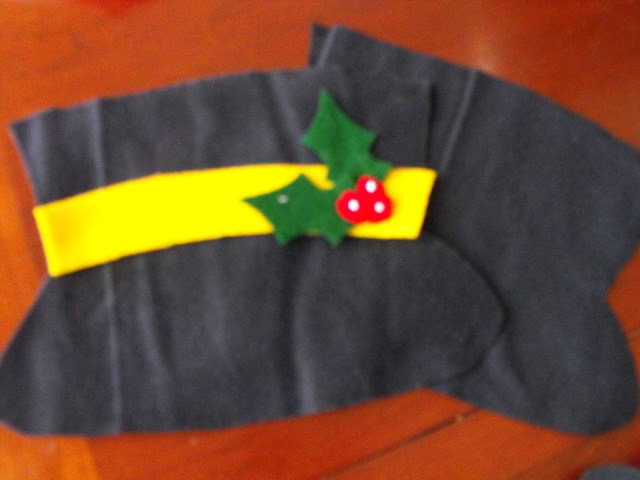 I didnt show pictures , but you will need to sew/glue a ribbon or felt loop to the top of your hat for a hanger. 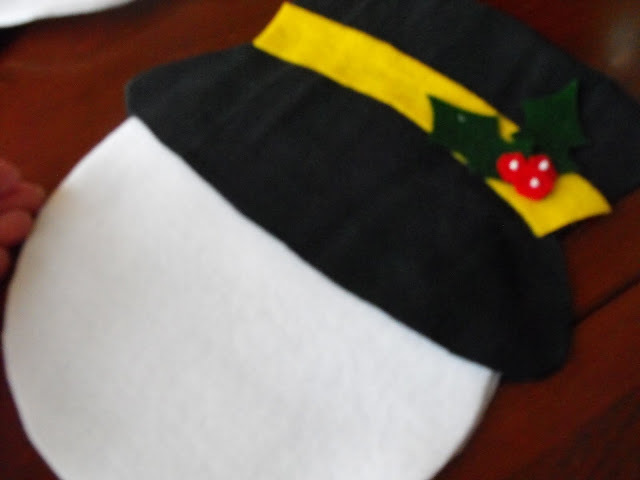 I'm off to finish mine now and will show you the finished stocking. I also have a cute DIY goodie we will make to put inside. Susie I have been following your blog for a few monthes now- thanks for all the inspiration you share and pass on to all of us. I LOVE your blog and ideas!!!! Have a happy and healthy holiday season-and thanks again for sharing so many of your ideas. Thanks "room mom"! I know how you give of yourself to the kids and school and it is appreciated! These are adorable and a lot of work! Phew! Way to go Susie! Those snowmen are adorable. The kids will really enjoy them. That is the sweetest idea I have seen in a long time. So cute. Where do you come up with all your ideas? So cute! My kids are in High School, but it brings back lots of room mom memories. I miss it! Oh, Susieness, you're too wonderful. These little stockings are so precious. I really love your DIY wreath you made as well. GREAT idea and so pretty! What a great idea. They look so sweet. The kids will absolutely love them. What a great room mom!!! Enjoy the season!! We all know you are a busy lady. Don't sweat it. I just look forward to visiting and seeing all the great goodies you have. How adorable are these !! You are so crafty. And...you take all the time away that you need...we are all doing the same thing. Just a busy time of year and after the 1st, we'll all get back in the swing. (I think I mentioned this before.. Same sentiments with me! I'm trying to get things done and I'm limited on reading posts right now. But the thought is there, and we'll all get through this holiday season together. And then it will be January and a slower pace. You are such a devoted mother! Wow cute, wonder where you got that cute idea? Don't get so busy that you forget ya sista! Those are precious! Keep the inspiration coming. Just precious! Like you!! If you get a sec, hop over and see my new wreaths! I am so excited! What a great Mom and roommom!!! I am feeling guilty, now! My daughter is in 1st grade at Dutchtown Primary - so when they call and let you know that you have been signed up as her "room mother", please don't act too surprised!!! love the stockings especially with the added "cuteness"
Hi Susie, well, I think every mother choose you to be the room mother, and I understand why... your craftings are so, so lovely!!! the kids will enjoy them a lot... filled with candies??? I know these will be a hit. Wow! You are, like, the greatest room mom ever! ;) Those snowmen are adorable!!! Ditto with the computer time...I haven't ready any blogs this weekend between Friday and now. It was actually a bit refreshing. I am finding that as my blog (slowly) grows, I am having a hard time returning each comment like I used to. Aw, SusieQ, you do not have to respond :) I just love coming here and I know you love your readers. Judy, of Gracious Southern Living, and I were talking one day recently of how we enjoy your blog and that you truly appreciate your readers. Have a beautiful season and thanks for all you do to teach us these neat ideas!! Those are the cutest little snowmen! Such a cute idea. Love them. You are SO creative!!!! Love them! that's a great idea. I got elected home room mom this year. 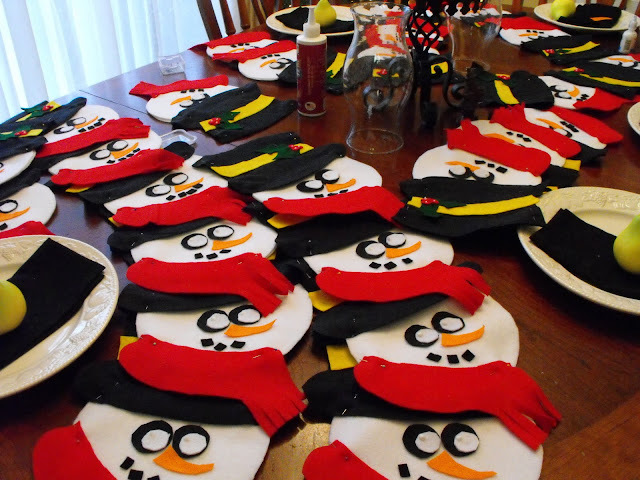 This looks like a fun craft for our christmas party. thanks. Such a cute project. I'm adding it to my Inspire My Saturday feature today. Adorable!! These are just too cute.